Financial Assistance for Roof RepairsI am a 59 year old widow on unemployment. My credit is not good, but I am in dire assistance getting my roof repaired. I live in Anderson SC. Roof Replacement Assistance for Low Income HomeownersI am a low fixed income home owner seeking help on roof replacement in Arkansas. Is there any emergency aid out there? Roof Repair Assistance for Low Income HomeownersMy mom's roof needs to be replaced. She lives on a fixed income, and doesn't have the money to do it. Are there any places she could call to get help with it? She lives in Morganton North Carolina. Roof Repair Assistance for a Low Income Homeowner on DisabilityI am in need of some roofing repairs. I live in Pennsylvania. There are about 4 spots leaking pretty good. I am sure the roof is 20 years old, but I am more than fine with getting the spots fixed. Does anyone know of any places in PA that can help a low income homeowner on disability get repairs? Roof Repairs for Low Income HomeownersHow do I get help to get my roof fixed? I am on a low income. Roof Repair Assistance for Low Income HomeownersI am 48yrs old, and I recently lost my job, though I am currently looking for work. I do not have a bank account, my house is 118 years old. Parts of my roof have fallen off, my roof also leaks very badly. I am in desperate need of a new roof. The entire roof has be replaced, not only the shingles, but the entire roof. Roofing Assistance for Senior CitizensIs there any help we can get to put a new roof on our house? Are there any loans we can see if we can apply for? Is there anyone to help out senior citizens in this situation? Do they go by what income you have? Roof Repair Assistance for Senior CitizensAre there any programs that you know of that can help a senior get her roof repaired? Roof Repair Assistance for SeniorsIs there any company or organization that offers help to an elderly woman, 80 years old, in Deerfield Beach Florida that has a roof leak that has caused a portion of the ceiling in her living room to drop down. The rain is getting inside. Roof Installation for Senior CitizensMy husband and I are seniors. Our son paid for roofing material, but can't afford to pay for labor to have it installed. Is there any kind of free help out there? I can furnish food and water or tea. Roofing Assistance for Low Income HomeownersI requested a claim on my homeowners insurance to get a new roof. I was issued a check for 1500. I know a new roof and the labor cost more than that. Where can I get help getting a new roof since insurance won't help with entire funding. I only bring home 1100 a month and I'm trying to put my son thru med school. Roof Repair Assistance for Low Income HomeownerI need help with my roof. I don't have good credit and my roof leaks and has a hole in it. My insurance lapsed and I need a roof. I can pay monthly payments just don't have the funds now. I can only pay back in monthly payments. Where can I find help? Roof Repair Assistance for Low Income HomeownerI am in bankruptcy and have just enough money to pay my bills. I need a roof and windows badly. Where can I find help? Finding Roof Repair Assistance for a Low Income HomeownerI am a low income homeowner. I just got a new job and have a salary, but due to my bills have a bad credit. My situation is that I desperately need a new roof in my house and can't effort that. Roof Repair Assistance for Low Income HomeownersWe are low income and need our roof repaired. We have a leak right now. I am afraid it will continue to get worse. We just about make our bills as it is. I am at my wits end. Where can I find help? Roof Repair Assistance for Low Income Home OwnersI live alone and need mobile home repairs. The roof is leaking and the floor caved in. I live in a park and still have a mortgage. I am low income and live in Fruitland. Md. Are there any agencies that can help me? Home Repair Assistance for Low Income HomeownersI have a friend that needs help with the house and a AC unit that is free or cheap because they are on disability and have no extra money to fix the house. Please let me know what I can do to get it fixed and a AC unit. Roof Repair Assistance for Low Income Homeowner in JamaicaI am in desperate need of help to fix my roof before the hurricane season starts. I really don't have any money. The boards are starting to rot, and a few of them already broke! The zink is rotten too. Are there any groups that can provide some assistance? I am in Jamaica, east rural. 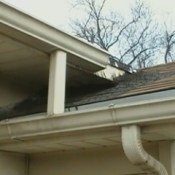 Roof Repair Assistance for Low Income HomeownersI am an 81 year old with a leaking roof and shingles falling off. I am on Social Security. Is there any help that I can get? Roof Repair Help for Low Income HomeownersOur roof was somewhat old and Hurricane Harvey finished it off. I am not eligible for FEMA help. I live in Fort Bend County, Texas. I own my home and land. I already have a replacement quote from someone. 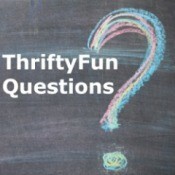 What are my best options in finding a charity or government grant to help? Roofing Repair Assistance for Low Income HomeownersI live in Minnesota in a mobile home. Our roof is leaking so badly. There are bad stains in every room. I am on Social Security and my partner is in very bad health so we cannot afford to fix it. Can we get help anywhere? Roof Repairs for Low Income HomeownersI'm senior citizen with a disability. Following a hail storm I need a new roof and other repairs. I don't have money for my deductible. Is there somewhere I can get help? My insurance will cover the rest. I live on Social Security. Roof Repair Assistance for Low Income HomeownersI'm in extreme need of a roof. I don't make much money. My wife was in a really bad car wreck a month ago and she has been left with several bad injuries and now will be blind for the rest of her life. I live in Athens Alabama I'm just hoping someone can help me. Roof Repair Assistance for Senior CitizensMy brother is a 75 years old and is a very sick man. He draws very little from Social Security. His roof is leaking and we haven't been able to get any health/help agencies from Pikeville, Kentucky, to do anything. Is there anyone or agency that could possibly fix his roof? He also has a leak around his bathtub area. Mobile Home Roof Repair Assistance for Low Income HomeownerI live in a 1970 mobile home and I am in desperate need of a new roof. I can't afford to pay much of anything. Is there help out there? Condensation in Mobile Home RoofI am dealing with the coffee stained ceilings. Would a layer of foam on top of the factory roof help this? I have a new roof over that with plenty of ventilation. Roof Repair Assistance for Low Income FamiliesWhere can I get help with roof repairs? Preventing Condensation Between Trailer Roof and CeilingI have a tin roof on my trailer. How do I keep the condensation out between my ceiling and the roof? Roof Repair Assistance for Low Income VeteranMy husband is a retired veteran. He was diagnosed with COPD a couple of years ago. We experienced roofing damage during hurricane Matthew and tried to get help through FEMA, but because we have home owner's insurance, they couldn't help. Roof Repair Assistance for Low Income FamiliesMy roof had a tree fall on it. I have been in cancer remission almost 3 years now. I have custody of 2 of my grandkids. They are 4 & 5. The 5 year old has autism & ADHD and the 4 year old is newly diagnosed with junior idiopathic arthritis. I am 60 years old and I make $12.12 an hour. Roof Repair Assistance for Senior CitizensI am seeking senior programs to put a new roof on my house for free. Finding Roof Repair Help for Senior CitizensI need help with roof repairs, I have some materials, like 18 packs of shingles. Habitat for Humanity only helps veterans. When I call, here in the state of Georgia, they are not helping senior citizens with home repairs. They say the program ran out of funds. Roof Repair Assistance for Low Income HomeownersI am 50 years old and legally blind. I live in West Virginia. The roof is collapsing on my house. I have the materials to replace it, but I can't afford to pay anyone to do the labor. I receive Social Security disability and used all my back pay money to buy the supplies. Finding a Roofing Contractor That Accepts PaymentsMy roof needs to be repaired. I don't have the money in full, I can do a monthly payment. The third room needs to be completely redone. 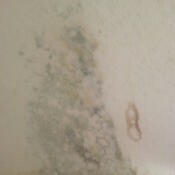 Since the room has a hole, that room has mold or mildew. Roof Repair Assistance for Low Income HomeownersI am 56 years old and I have a leaky roof. I'm on disability; where can I find help? Financial Assistance for Fixing a Leaky RoofI will be 58 next month (July), am disabled on a fixed income and live in a pocket of Maricopa county in Mesa, AZ. My roof is in such bad shape I couldn't get insurance. It leaks and is threatening to collapse with each rain. I desperately need help getting it replaced and the damage inside repaired. Roof Repair for Low Income HomeownersI'm 80 and have cancer and can no longer work and now I live on SS. I need a new roof and can't afford to pay for one. I live in south Florida and it's summer time which means it rains a lot and my roof has many leaks. Where can I find help? Roof Repair Assistance for Low Income HomeownersWho helps people with low income to repair a leaking roof? My mom's roof is in bad shape. She's on a fixed income. She lives in Elbert County, Elberton Georgia. Roof Repair Assistance for Low Income HomeownersDo you know any government programs that can assist me in repairing my roof? I am a single mother of 3 kids. I can not afford to repair my roof. I don't make a lot of money at my job and I pay all my bills by myself. I have no money left after I pay my bills and I really need a new roof on my home. Inexpensive Roof Replacement for Low Income HomeownerI am 60 years old and disabled. The last time I had my roof replaced it was a joke. I am not able to get it fixed. Is there any way to get it replaced where I don't have to stop eating to pay for it? Roof Repair Assistance for Low Income HomeownerI'm on disability and need help with getting a new roof. Where can I get help please? Roof Leaking in Mobile HomeMy mobile home roof is leaking water how do I fix it? There is no water on the outside of the roof. Could it be condensation? Home and Roof Repair AssistanceI have a neighbor who is a single mom. 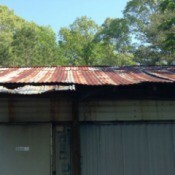 She desperately needs a new roof with much wood replacement and many other repairs to her home. She has no income, but does own the home. Can someone please refer me to someone who can help her in the Jacksonville, Florida. Roof Repair for Low Income HomeownersMy roof is falling in and has mold on the outside. 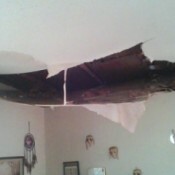 My ceilings are also falling in on the inside of my house from the roof leaking. I have black mold growing in my installation. I do not have the money to fix this. Roof Repair Assistance for Low Income HomeownersI am in desperate need of a new roof, but I do not have the money. I have tried to get a loan, but my credit is not too good. I am a single mother. Financial Assistance for Roof RepairHow can I receive help with the repairing of my roof? 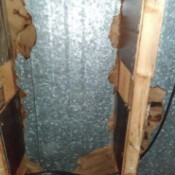 I need a donation of materials and a licensed contractor to do the repair. I do not have the money to pay for the work. I'm willing to set up some kind of payment plan. Is there any way I can get the help I need? I have less than 3 weeks to have it repaired. Roof Repair for Low Income HomeownersI live in Illinois and am unemployed. I have been experiencing leaking issues with my roof. It's so bad it's raining in my dining room. I can't find any programs or funding programs. I need suggestions for help in the suburban area of Illinois. 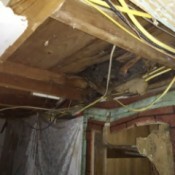 Finding Financial Assistance for Roof RepairsI need help, including donated materials and a licensed company, to help bring my roof up to city codes. I do not have the money to pay for this work. Is there any way that I can get the help that I need? Roof Repair Grants for the ElderlyAre there grants for roof repairs for the elderly living in Lithonia, Georgia? Roof Repair for Low Income FamilyI live in Gallup New Mexico. I have guardianship of 3 kids and a single uncle. My roof has been leaking and I need help. We are on a very fixed income. We are looking for a new roof, but can't find the money for it. Is there any agency out there that would help? Roof Repair Help for Low Income FamiliesI'm in dire need of a roof and can't get a loan. I'm the only income in my home and make under 30,000 a year. Community assistance is overwhelmed with people needing assistance. Does anyone have suggestions for me? I live in Alabama. I'm really stressed and can't get help from anywhere. Roof Repair Assistance for Senior CitizensIs there anywhere besides the city roofing program seniors can get free help? Roof Repair Help for Low Income FamilyI live in South Carolina. How do I go about getting my roof fixed? It's a family house owned by my uncle. He receives disability and so do I. Is there anyone in the Horry county area that could help us? Financial Help for Roofing MaterialsMy roof is leaking badly. I am so deep in debt that I can't buy roofing materials. My husband can do the work, but I need to know if anyone knows of an organization or something that can help me get the materials to do it with? I live in Clinton, Oklahoma. Thanks in advance. Finding Help With Roof RepairI'm a Vietnam vet and need a little help with roof repair. Where can I go? Financial Assistance for Roof RepairI'm looking for a grant to fix my 40 year old roof. This past winter it was leaking in 4 different places. I'm 66 yrs old, on Social Security, and can not afford to pay for a roof and ceiling fixtures. Where I can get some help? Financial Assistance for Roof RepairI'm am on disability and my roof in my bedroom is leaking causing a hole in my roof. I have no money to get it fixed. Does anyone know of any programs, loans, or grants available to help? Getting Assistance with Roof RepairsI need assistance with roof repairs in Rogers Arkansas. Who do I contact? Finding Agency to Help Replace RoofI can't get insurance on my home until I put a new roof on it, but I cannot afford to do this. I am a disabled vet and have a limited income. Is there anywhere I can go to get help for this in South Carolina? Financial Help for Roof RepairsI am 80 years and low income and have wind and hail damage on my roof. The house was built in 1995 and has not been re-roofed. My insurance wants a $5,000 deductible, which I do not have. I live in Stockton, Missouri. Is there any help for me? Roof Replacement for Low Income HomeownerI need a new roof and I am very low income. My roof is in total disrepair. I have huge ice dams because of this. I am a single mother with three kids. Finding Help With Roof Repair for Elderly ManMy grandfather who will be 80 later this year and is living on Social Security only is in need of some roof repair. My brother and I, with our spouses, have been trying to make the other repairs that are needed. I still have to save the money for painting the inside of the house. Roof Repair for Low Income FamilyWhere can I find financial aid for roof repair in Clarksburg? My mom and dad's roof is in need of serious repair and I don't have the money to do it. Can any one offer assistance? Roof Repair for Low Income IndividualI know you probably don't help with what I am in desperate need of, but I am just hoping that someone can help me find the right club or organization to help me. I have a hole in my roof and a few more really bad spots and am in desperate need of a roof. Help for Low Income Family With Roof RepairsI am a low income widow in need of finding a grant to assist with roof repair. I am having very bad leaks. Finding Help With Home RepairsMy neighbor who is 93 years of age has a house that is also 93 years of age. It does not show a lot of damage to the home, still she does need some repairs. Also she really needs a roof put on. Without that roof she can lose her home insurance within three months. How can I find her some help? Home Repairs for Low Income FamiliesMy neighbor is disabled and not able to work. His wife works and makes little and his mother lives with them and makes a little, also a mentally disabled brother. Financial Assistance to Repair Leaking RoofI am a widow living in my house with the roof leaking. It is so bad I had to cover it with a tarpaulin. The insurance company refuses to sell me insurance because the roof is leaking right now. Roof Repair of Low Income FamiliesI live in Ohio and I just found out I need a new roof on my house. I am totally disabled and live on Social Security only. I have no other assets. Where I find help? Finding Financial Help for Roof ReplacementI need a new roof, but I don't have the money to get it done. I'm unemployed and I've started my Social Security. Do you know someone who can help me with this expense? Replacing Half of the Roof on a HouseI desperately need my roof repaired. It rains in my house and there is mildew. I am using a tarp now, but am not sure how long that will last. I also have half the money saved. Someone suggested doing half the roof. Is that a good idea? Help Fixing Floors and RoofMy daughter is disabled and has 3 children. She is buying a house and doesn't have the funds to fix it. Is there anywhere she can get help with this? She can't even get her home owner's insurance because of this problem. Need Help With Home RepairsI live on $700 a month SSI. My trailer is completely falling apart. I have tree limbs falling on the top, so I have holes in my roof. I have windows that are leaky. I have vents for the heat, but only two work because of raccoons and other animals. Roof and Sewer Repairs for Low Income FamiliesWe bought a house last year; we are a low income family of 5. We don't have the money to get our roof fixed or sewer. Roof Repair Assistance for SeniorsHow can my mom qualify for roof repair? It will need to be done soon. The roofer went out today to inspect, as we need a roof certification for insurance purposes that she needs vs the one she now has. 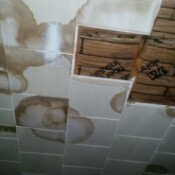 Roof Leaks Around Sky LightsI have sky lights over my master tub and 2 in another room. All 3 leak. Can I use the wet/dry black tar on top of shingles? The water falls are now damaging floors and walls. Repairing a Rusty RoofWe a problem with the metal roof on our church, rust. Every few years we have the costly job of repainting it. We are thinking of using, Extend, but have some questions. Is Extend recommended for use on metal roofs that see direct sun all day?